When you hire our expert team of Leicester painter and decorators in Leicester at Mark Rogers Decorating, we want you to be thrilled with every phase of your painting and decorating project. That’s why we only employ the best. All of our painter and decorators in Leicester are fully qualified and time served tradesmen. They all have to work to our very high standards and we carry out regular checks and final inspections on all of our projects. If you have an interior or exterior painting and decorating project in Leicester then let our specialist team of Leicester painter and decorators in Leicester give it that professional look. With over 20 years experience you can guarantee you are in safe hands. We are both ‘Dulux Approved Select Decorators’ and ‘Trust Mark Members’ which also means you get two years guarantee with any Dulux paint we use on your project. Whether you are repainting the interior lounge in your home or painting your new commercial building before the exciting grand opening event, you can trust our team of painters and decorators in Leicester to do the job right from start to finish. Every project is completed to your specifications and on-schedule. 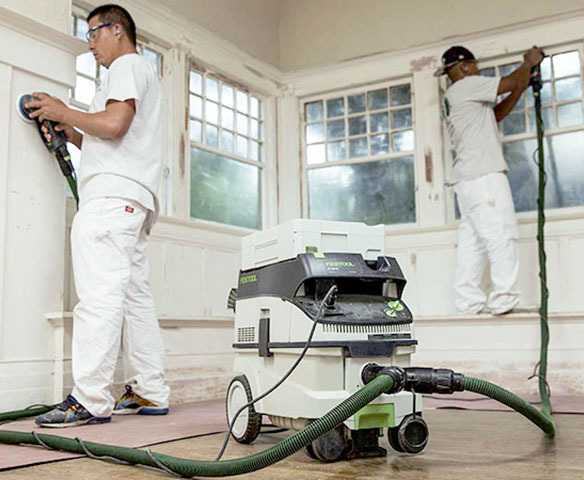 Our Leicester Painters and Decorators at Mark Rogers Decorating Services use the latest dust free sanding system from Festool. Dust is produced when sanding and sawing wood or mineral materials, and this can become a serious health risk.